POSTED September 23, 2018 4:47 p.m.
One day after St. Mary School in Platteville reopened, its church held a dedication Mass to celebrate the school’s reopening Wednesday afternoon. 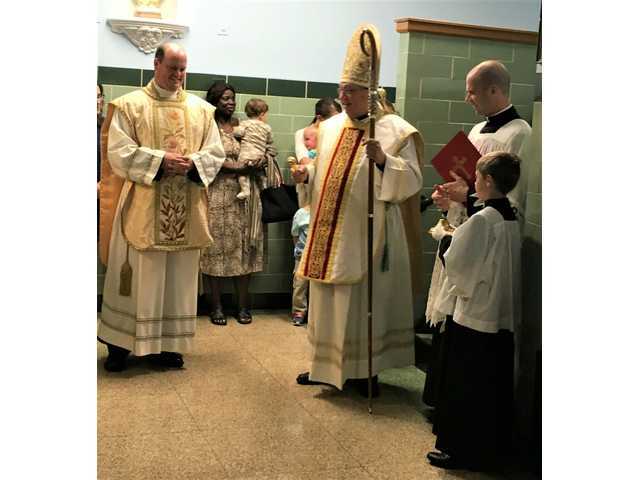 The closing of St. Mary School in June 2012 was on the mind of Madison Catholic Bishop Robert Morlino, who celebrated the Mass. Morlino started his homily by acknowledging “the existence of evil in the world, and the existence of evil in the church, but now is not the time to go into detail about that. It is time to go into detail about the victory of truth over falsehood, the victory of good over evil. The closing of the school when it happened was the work of the Devil — the Devil attacking beautiful families who [sent children] to the school, attacking these great priests. St. Mary School closed June 1, 2012, two years after the church began to be staffed by priests from the Society of Jesus Christ the Priest. Some parishioners left the church, donations declined and enrollment in the school dropped, resulting in the decision to close the school in April 2012. The school was going to reopen one year ago until Rev. John Blewett, the pastor of the church, decided the building wasn’t ready for students. The school opened Sept. 4 with six four-year-old kindergarteners. The letter can be read at https://madisondiocese.org/documents/2018/8/Letter%20to%20Diocese%20-%20Abuse%20Scandal%20-%20August%202018.pdf. The letter states that Morlino will offer a “public Mass of reparation” at Holy Name Heights in Madison Friday, and he asked diocesan priests to offer similar Masses. He also asked “priests, clergy, religious, and diocesan employees” and other Roman Catholics to engage in “fasting and abstinence in reparation for the sins and outrages committed by members of the clergy and episcopacy” Sept. 19, 21 and 22, the Autumn Ember Days. “We really have to keep up prayers and fasting” against “the Devil, who continues to be our enemy, about like a roaring lion seeking someone to devour,” Morlino told those at Mass.